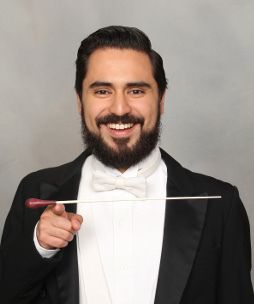 Raul Dominguez is currently earning his master’s degree in choral conducting at Ithaca College in Ithaca, New York. At Ithaca, he studies conducting with Dr. Janet Galván, assists with undergraduate conducting courses, and has conducted works from Tallis to Arnesen with all choral ensembles. He also conducts the Intergenerational Choir, comprised of Longview Retirement Center residents and Ithaca music education students. Prior to Ithaca, Raul was the choir director at Clear Lake High School in his hometown of Houston, TX for four years, where his groups were recognized with invitations to perform alongside the nationally-recognized Houston Chamber Choir as well as the Houston Symphony Orchestra and Chorus. Under his direction, students performed such repertoire as Mozart’s Coronation Mass and Schubert’s Mass in G Major, and consistently earned superior rankings at contests. The choirs regularly performed for Houston notables, and gave their Carnegie Hall debut in 2017. Raul holds bachelor’s degrees in vocal performance and music education from Oklahoma City University where he studied with Dr. Randi Von Ellefson and Judith Willoughby. In 2016, he received a conducting fellowship to the Yale-Norfolk Chamber Choir and Conducting Festival with Dr. Simon Carrington and, in 2013, was First Runner-Up in the National Undergraduate ACDA Conducting Competition. Raul would like to thank Chorus America for the opportunity to participate in their 2018 Conducting Academy.